Art in public space in the form of a proper campfire area. The terrain is wonderfully suited for calm repose, for being together socially and, for those driven by curiosity, for leisurely exploration further afield. Set on a small rise, reachable by a short stairway, bordered by two large pine trees and some shrubbery, the view affords surprise in the face of a landscape rolling into endless distance. Another standpoint reveals the stadium, reminiscent of the goal of being here and a part of things. 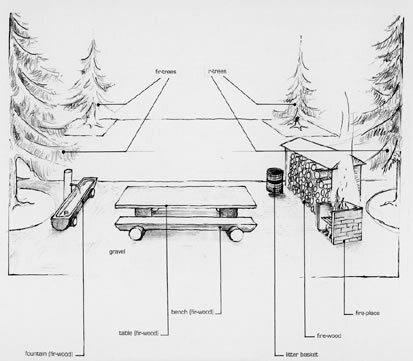 For a shorter or longer moment of calm, the following are provided: a fountain made from a hollowed tree tunk from which fresh water flows; a wooden table with two wooden benches and matching, equally rudimentary chairs, a place for grilling with three seats made from three short tree stumps; a generous woodpile that has found weatherproof protection (two brick walls and a tile roof); a string of lights diagonally illuminating the place of togetherness, and a flagpole demarcating this special site with the fluttering of a Swiss flag in the wind. An invitation to be still is here communicated whereby specialness is found in the commonplace of another culture: the staged outdoor campfire site is, in Switzerland, a popular feature of daily life where friends and family meet for the pleaure of grilling and eating and, in fine weather, of spending time together in a natural setting. The specialness here, on the way from the train station to the football stadium may, at first glance, surprise the visitor. The invitation, however, not only to enjoy the site but to pause and experience it and its view while eating and drinking together, allows this place to become a pleasurable, why not paradisical, moment of being. Overall view of the installation. In the background, football stadium entry. 3Detail construction drawing, fountain. 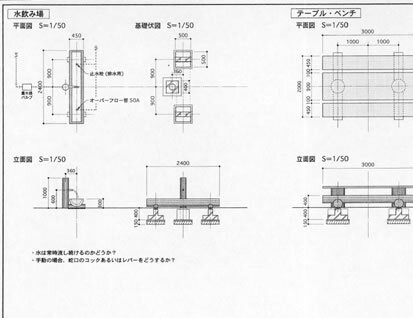 Bird's eye view, lateral view, foundation (CLIP Architects, Tokyo). 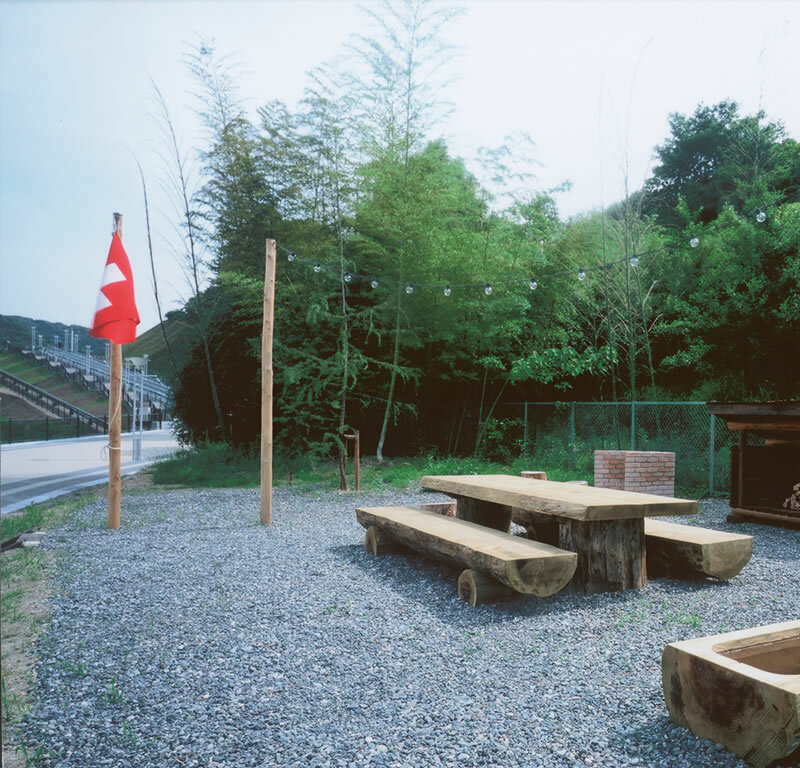 Wooden benches, wooden table, brick outdoor fireplace, wooden shelter for firewood, 3 treetrunks, flagpole with Swiss flag. 2 wooden poles with chain of lights, trashcan, gravel. 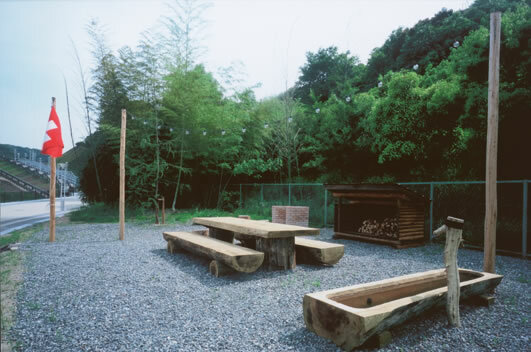 Entrance to area with wooden timbers, gravel, 2 pine trees, electric installation.